I haven’t read a Green Lantern title since Kyle Rayner had the ring and Hal Jordan was as dead as Barry Allen and Bucky Barnes put together. Does this re-introduction to Green Lantern have me swearing an oath to read it every month or swearing off comics for good? This issue kicks off with someone reciting the Oath of the Green Lanterns, and it is revealed to be none other than…Sinestro? Dressed in an update of the classic GL uniform, surrounded by Oans, and bound by chains of lantern energy, we discover that the ring chose Sinestro to reclaim his old title of Green Lantern, possibly for a chance at redemption for his betrayal of the Corps. The chains fall away and upon asking what is expected of him, Sinestro is informed, “…What other Lanterns do… Protect your sector.” A nice opening sequence, and I enjoyed the tense exchange between Sinestro and the Oans. Sinestro departs for his home sector and we learn the Oans are working off the axiom, “keep your friends close and your enemies closer,” then the Guardians turn on Ganthet, in an effort to make sure they are of one mind for their new mission. I like the intrigue going on here, setting up some questions for the future. We then cut away to Hal Jordan, no longer possessing a power ring, but instead possessing a host of financial problems. This subplot bugged me, I thought it felt a little too Peter Parker for my tastes. He quickly jumps into hero mode, mistakenly assaulting an actor and getting arrested. Carol Ferris bails him out and we find that Hal was booted from the Air Force for being MIA because of his GL duties. Ferris Air is willing to offer Hal a bit of redemption of his own with a job offer, but not as a pilot. Carol and Hal casually discuss their costumed pasts, and it’s established that she is aware he was a Green Lantern, and she is the former Star Sapphire. With a new #1 as a new introduction to the concepts and characters, I think Johns took an interesting approach in that the issue focused on characters that all appeared in this summer’s Green Lantern Movie. If someone only familiar with the film picks this up, there will be lots of names they already know. I’m not sure this was deliberate, but I’m guessing it was, giving the reader familiar and relatable characters, not necessarily in a familiar situation. I know the Green Lantern mythos has expanded greatly in recent years, and I found most of the exposition of past events making me curious about the back story and not dreading it. Why isn’t Hal a Lantern anymore? What is the Guardians’ new mission? 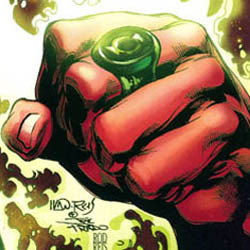 What is Sinestro’s angle with Hal, and why did the ring choose him to become a Lantern once more? All these questions have me curious about where the story is going, and if those questions have been answered in previous books, I hope Johns will answer them as deftly as the exposition in GL#1 had me asking them. I have to admit to being more interested in Sinestro’s story in space, and his dealings with the Guardians and the Yellow Lanterns than in Hal’s more mundane earthbound financial and romantic problems. I’ve always enjoyed the galactic backdrop and weird aliens of Green Lantern as the concepts that set it apart from other DC superhero stories set on earth. It appears these two worlds will be colliding as early as issue #2, so I’m not too concerned that Hal’s money problems will consume every issue of the book. I am a bit concerned that Hal comes off as a jerk in the book, but redemption seems to be a theme here, so perhaps we’ll see Hal and Sinestro approach possible redemption each in their own way. The art on this book was good, and I enjoyed it. I like clean art and Mahke/Alamy delivered, the art is detailed but not over rendered, with generally tight pencils and bold clean inks. I’m not a fan of a lot of the modern computer coloring, but I didn’t notice it here and that’s the point. The coloring integrated with, and enhanced the pencils and inks for a nice overall package. While it didn’t blow me away this was a good re-introduction to Green Lantern. I finished the issue wanting to know more. That’s the point of the New 52 so the story did the job it set out to do. 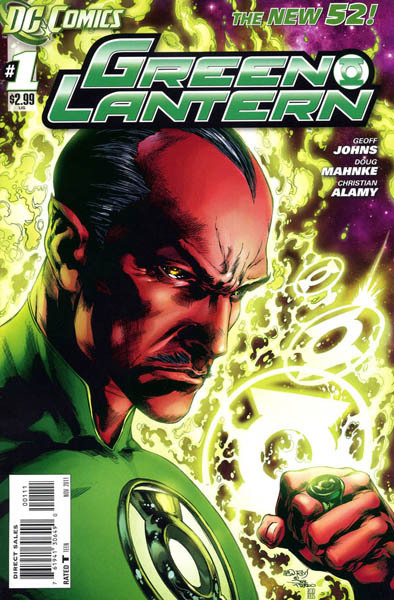 I think a lot of the conflict and interest in this book will come from the fact that neither Sinestro nor Hal like their current situation, and will have to work together to achieve their goals. A good story with solid art earns Green Lantern #1 three stars. My main worry is that the Sinestro thing is a short-term sensationalistic tactic, and that Hal will be back in his ugly suit within the first six issues. If you’re gonna do a story like this, I say commit! Amen to that, though with that last page I am no longer optimistic about the likelihood of Sinestro retaining the ring. I felt a little underwhelmed by this issue. I’m just not sure if someone in DCs “target demographic” will have any real idea as to what is happening, who these people are and why they should care. The very last page of the book was a real turn-off for me. Where I thought this plot arc was going and where it ended up are two very different things. This one is a great example of everything DC is doing wrong with the New 52: no clear explanations, confusing backstory, incomplete story. All you get for 3 bucks is Sinestro getting the ring, returning home and meeting some yellow guys who talk about “his Corps.” Hal being lectured by Carol about his problems, and Sin reappearing at the end. I don’t think readers new to comics are going to be hooked by issues where nothing happens and nothing resolved. People expect stories (that’s beginning, middle and end). This is a first issue, so a reader picks it up expecting a “jumping on point” (let’s not assume h/she’s seen the movie) and finds some red guy getting a ring back (What is the ring? Who are the blue guys? What did the red guy do to lose the ring? Who are the yellow guys? Who is Hal Jordan? 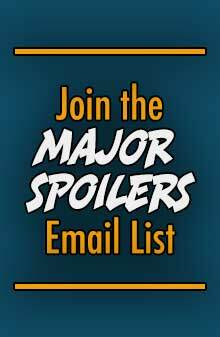 These aren’t teasers – this is stuff long term fans know but new ones are left to figure out, IF they decide it’s worth the effort.) Then the story just cuts off with Sinestro meeting Hal Jordan. The first issue should set the groundwork for the series, and we don’t even know who Green Lantern is at this point! This may be a great read for fans who’ve been through the Emerald Twilight-Parallax-Kyle Rayner-Rebirth-Sinestro Corps-Rainbow Lanterns-Darkest Night-Brightest Day arcs since 1994, but I’m judging these on their ability to reel in new readers and save comics. If DC doesn’t have the resolve to completely relaunch, as in Silver Age, or as the New 52 did in GREEN ARROW, DEMON KNIGHTS a few others, the whole New 52 thing comes off as another “#1 issues sell better” ploy. This one is a great example of everything DC is doing wrong with the New 52: no clear explanations, confusing backstory, incomplete story. Some characters get entirely fresh starts (Superman, for example). Other characters are just continued from the same point their last titles ended on (as this story is just a continuation of the ‘last’ Green Lantern book). What was the point of rebooting the entire universe if you’re only going to do it halfway? We got Hal in JLA. Hal is a complete arse in JLA. And, while I get that JLA is supposed to be ‘Five years ago …’ or whatever, but how is the new reader demographic that DC is supposedly trying to attract with the reboot going to reconcile what they see going on monthly in JLA with what they see going on in the titles that are nothing more than continuations of stories from a universe that supposedly doesn’t exist anymore … ? What did you think of the actual books? Good question, MP. Some books have been outstanding in my opinion (Batwoman, Batgirl, Stormwatch, Swamp Thing, Action and Detective Comics). Some have been just plain crap (JLI as the prime example). As I said in a later post, I’m feeling a bit hoodwinked by this whole supposed reboot. Most of what I’ve read so far (regardless of my like or dislike) have felt more like just another issue and not a reboot. Keep in mind DC never said this was a reboot, just a relaunch. 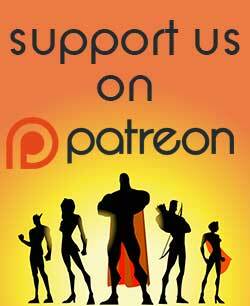 I am not reviewing the books as such, but as to how well they will serve DC’s stated goal of attracting new readers. To do that you have to explain the characters, and give the reader more than a small slice of story where nothing much happens. None of those books were supposedly designed to attract readers new to comics. As far as I know they didn’t generate an upswing in comics sales. They were written for longtime fans who expected more of the same, but at least they did a better job of setting up the basic premise of the series in the first issue. I wasn’t kidding at the top of the review when I said I hadn’t read a GL book since it starred Kyle Rayner. Oddly enough the reason I picked up GL back in the day, was that I wasn’t particularly interested in and had no affection for Hal. The Emerald Twilight story actually got me to put Green Lantern on my hold list for a couple of years, even though long time fans were screaming about bringing Hal back, how Rayner sucked, this was the end of Green Lantern as a concept and on and on. The New 52 is a company wide example of ‘Your Mileage May Vary’. 52 titles and characters are going to be approached and tweaked from 52 angles. I read the book, and found it to be accessible enough. For someone completely unfamiliar with GL it might well have been impenetrable, but as I mentioned in the review, someone who’d only seen the Green Lantern Movie would recognize all the main players in the issue. It had me asking a lot of questions, but as long as those questions are answered in subsequent issues then there was no harm is asking them. Piquing the curiosity of the reader is not a bad thing. Batman AND Green Lantern books are supposed to be getting very little change with the new 52… A minor tweak here and there (such as the Robin timeline and exactly how long Kyle was GL w/o the Corps around), but DC decided to do a smart thing and not make their 2 most popular books start from scratch (thus making those reading said books angry at something that wasn’t broken..). First of all, I’m a HUGE GL fan. I love the “palace intrigue” of the Guardians, love the relationship between Guy Gardner and Kyle Rayner, love the peripheral stories (Blue & Red Lanterns, etc. ), and when the ring found Sinestro at the end of War of the Green Lanterns, that was a truly sweet moment of surprise and pleasure! But this #1 was, in my opinion, completely worthless, except for the scene where Sinestro kills a Yellow Lantern for wrecking his homeworld. Sinestro is a badass, no doubt about it. But that ridiculous scene where Jordan leaps across the building and into a movie shoot? WTF?! Was DC afraid they couldn’t fill an entire issue with Sinestro as GL? Personally, I don’t care about Hal Jordan. He’s a boring character who adds nothing to the GL mythos anymore. Guy, Kyle and now Sinestro, have more appeal in their little pinkies that Jordan has in his entire body. This issue was the one I was most excited for, and I was, as someone earlier said, completely underwhelmed and let down. So far, I’m giving DC 2 out of 5 stars for their supposed reboot. As I’m reading more issues as they come out, I’m beginning to feel hoodwinked. I dunno, when I look at Hal now through the lens of that guy from high school who was the football star and maybe peaked in high school (much like Napoleon’s Uncle Ricco), I tend to understand the character better. He doesn’t know how to be a regular guy anymore. He’s had unimaginable power and the ability to do anything he can think and now he has to deal with getting a sucky job to pay his bills so that he can afford gas money, whereas before those things meant next to nothing for him because he could just fly wherever he wanted to be. Bruce Otter even mentioned he felt like Hal was a bit of a jerk here, well welcome to all that Hal has been known to be for years. That seems to be a vital part of his personality, not just his history. But, in this case, looking at someone who had so much and now has none of that power and ability now, it changes slightly how his exchanges with Carol seem, he’s too focused on himself to even realize he’s offending her or how his asking her out might sound. I did enjoy this issue, but I’m confused by how it picks up where the “old” DCU left off, and how that jibes with the Hal Jordan we just saw in Justice League. Maybe Blackest Night and all that took place in the past five years? I agree with what others have said: this may be a nice continuation of the previous GL series, but it’s a poor starting point for a reboot–er, relaunched DCU. What is the difference between a boot and a launch? Does continuing the story exactly from where it left off but sticking a big #1 on the cover count as either? How can they say it’s not a reboot when we have a totally new Green Arrow, Madame Xanadu, Shining Knight, etc.? Well, neither word has a hard and fast meaning (and, in fact, “reboot” is a pretty enveloping term). The fact is, the nomenclature isn’t really a big deal except inasmuch as that’s what DC wants to call it. I think we’re obsessing over minutiae, to be honest. If you want to call it a reboot, you can call it a reboot. 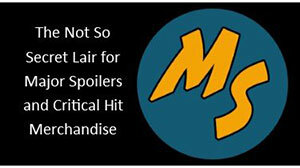 Major Spoilers generally refers to it as a relaunch. To be fair, I think those terms are interchangeable, with no one making distinctions between them. DC’s website refers to it as a “renumbering.” The way it has been hyped, however, my bet is most of those that are disappointed are so because they were/are expecting something totally new, not just cutesy tweaks. I just think of it as somewhere in the far flung past, a butterfly was stepped on, and as a result changes have been made. Large changes for some, and smaller changes for others mostly unaffected by the ripples of said butterfly. Okay, not exactly that, but if you just think that they’re presenting characters in the midst of their currently ongoing life, and at some point things have changed a little, their lives have gone down slightly different paths but some of their past history does get carried over. Reboot, Relaunch, Repeat, Rerun (wasn’t he on What’s Happening? ), Return, Re-whatever, as long as I know that if I go buy these issues and I’m not accidentally buying part 3 of 12 out of some huge mega event, or worse a peripheral tie-in to that event, I’m happy to have something new to read that could launch a whole new series of good interesting books. You know, I really liked John’s run on GL (Geoff Johns, that is, not John Stewart) In fact, it’s what got me buying comics in the first place. (I was wondering what was up in comics these days, and pirated *GASP* the first 25 issues or so of Johns new run. I rushed out to the comic store after that and put GL and GLC on my pull list. SInce then, I pull about 20 titles a month, including every GL book, plus I bought every Blackest Night book and tie-in, and I’ve bought all 52 issues of the new 52. So I guess you can’t say piracy is all bad.) All that aside, I loved Johns’ arc, I loved Blackest Night, but it’s been downhill from there. GL got into a serious rut. So Imagine how disappointed I was to be reading all the new hotness, then crack open “GL #1” and see that it was still in that same old rut. Absolutely nothing new here. If any character needed to shrug off the confines of recent events and get some fresh air (besides Batman) it was GL. So while the issue was a good, solid, 3 star issue, I’m 1-star worth of happy for the book. This was a perfect time to re-up my inerest in GL, but instead, they may have given me my jumping off point. Because I’m a sycophantic GL fanboy, I will probably let it coast for the first arc, and see if they breathe a little fresh air into it, but it’s on thin ice. Which makes me sad, because GL has been the bedrock of my pull list since I started it 3-4 years ago. So it was okay, but disappointingly familiar. I think “Stale” is the word I’m looking for. In a whole new world of new concepts and stories, the status quo that used to be “okay” all of a sudden becomes “old and busted.” We’ll see how my boy Kyle fares, and this new Red Lantern stuff. GL has been the weakest of the Lantern titles the past few months anyway.